Sara likes to travel and she likes to read. She wants to visit 50 countries before her 50th birthday, read all the Newbery winners, and go to Antarctica. She bounces around quite a bit, but comes home to Woods Hole every summer and has a tendency to work in bookstores and libraries. She special ordered books from Eight Cousins in the first or second year it was open and worked there intermittently in the summers during college and graduate school. She decided to stick around for a bit and is thoroughly enjoying seeing Cape Cod dressed up in different seasons. 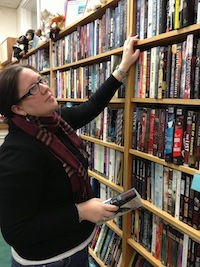 At Eight Cousins, she is one of the co-owners and handles the children's book buying, events, and programing as well as the store's digital media and marketing. If you have queries about one of those areas, please email her at books@eightcousins.com; if you want to chat about books, especially ones written by David Levithan or Justina Ireland or anything related to diversity in publishing, visit her at the store.